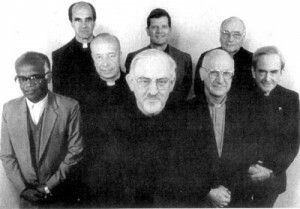 5/25/06 Part two of the interview by Meria Heller of Eric Jon Phelps author of “Vatican Assassins, Wounded in the House of My Friends”, still the pre-eminent book on the Jesuits. the black Pope; who are members of the Jesuits (some of your favorites perhaps); the sinking of the Titanic, not an accident; the Titantic and the passing of the Federal Reserve Act; JFK; Allen Dulles, Castro; Arlen Specter; is China the sword of the Jesuits for the 21st Century? 3 Responses to "Meria With Eric Jon Phelps – Vatican Assassins Part 2"
Wow – does this guy connect the dots ! I’ve always thought the Zapruder film was ‘edited’ and other than Jim Fetzer – that I learned from your site – Eric is the only other person I’ve actually heard it from. The way I’ve always looked at JFK’S awful murder is as ‘Open Season’ in Dallas – that anybody and everybody who wanted him dead could come on down a pick a spot a start a shooting gallery. Secret Service complicit – Miss J. Edgar Hoover, LBJ, The Mob, Big Oil, CIA, Castro and all roads lead to Rome ! Jesuits have their fingers in every pie! No wonder they want a grand for this book. Great interview ! This show is very interesting to listen to eight years after it first aired…..lots of water under the bridge…LOTS of name-dropping!!! Notice that Obama wasn’t even on the radar back then. He just popped up out of nowhere to become the Prez for two terms. Isn’t that conveeeeenient? Wonder for whom he is currently serving as the Jesuit placeholder. too many revisionist movies out these days to hide the truth. Like JFK the Smoking Gun which made me want to vomit last night.